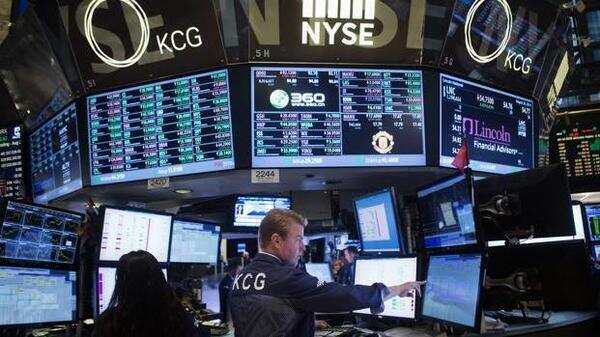 New York: US stocks fell in thin trading as investors cast an eye toward the start of earnings season. Treasuries fell as data confirmed the economy remains on solid footing. The S&P 500 edged lower in trading 20% below its 30-day average as the benchmark hovered just under the key level of 2,900. Health-care companies led the decline, while industrials paced gains as Boeing, still embattled in the 737 Max crisis, snapped a four-day losing streak. Banking shares rose before Wells Fargo and JPMorgan report first-quarter earnings that will lead off the season Friday. The 10-year Treasury yield rose toward 2.50% after data showed a strong US labor market and tepid price gains. The dollar advanced the most in more than a week, while the pound fell as Prime Minister Theresa May accepted the European Union’s offer to push the Brexit deadline out six months. Investor optimism on global stocks and commodities has endured even as warnings about a global economic slowdown abound. That bullishness may be tested as companies report earnings. Caution over economic pullbacks has emerged in comments from the European Central Bank, the International Monetary Fund and in the Federal Reserve minutes — which reinforced expectations that interest rates should be on hold for the rest of this year. Oil in New York retreated from a five-month high as an increase in US inventories to the highest since late 2017 overshadowed OPEC’s efforts to reduce production. In emerging markets, equities declined and were poised to snap their longest streak of gains in more than one year. India’s rupee strengthened as elections started. The S&P 500 Index fell 0.1% as of 1:53 pm New York time. The Nasdaq Composite Index fell 0.1%. The Stoxx Europe 600 Index increased 0.1%. The MSCI Asia Pacific Index sank 0.6% to the lowest in more than a week. The MSCI Emerging Market Index fell 0.7%, the first retreat in more than two weeks. The Bloomberg Dollar Spot Index climbed 0.3%. The euro fell 0.1% at $1.1261. The Japanese yen dipped 0.5% to 111.57 per dollar, the largest decrease in more than a week. The British pound declined 0.2% to $1.3072. The MSCI Emerging Markets Currency Index decreased 0.1%. The yield on 10-year Treasuries gained four basis points to 2.50%, the biggest gain in more than a week. Germany’s 10-year yield climbed one basis point to -0.02%. Britain’s 10-year yield advanced four basis points to 1.14%. The Bloomberg Commodity Index sank 1%. West Texas crude fell 1.7% to $63.50 a barrel. Gold decreased 1.3% to $1,296.00 an ounce.